During our recent setup of Azure ADConnect for one of our Clients we've been getting permission-issue – Insufficient access rights to perform this operation error. While there are many articles on the Internet it's either outdated stuff for DirSync or trying to fix it by Enabling inheritance. The case we had was much simpler. During setup our administrator has chosen the AzureAD Custom Setup and when that happens no permissions are set for you on the Active Directory side. 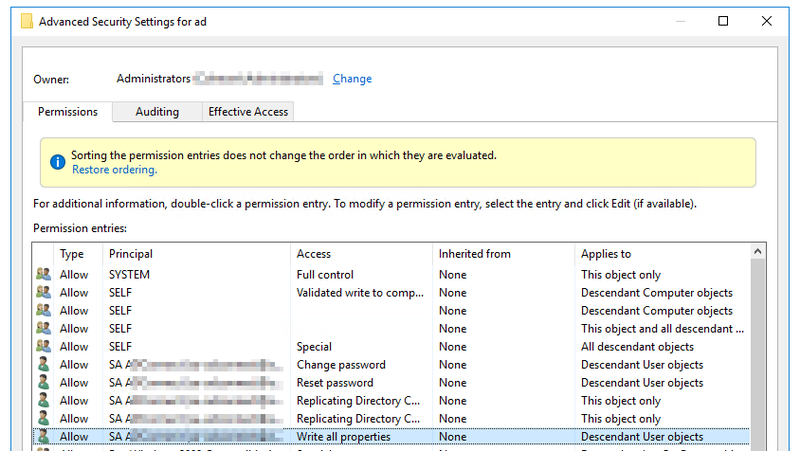 We knew where to look, we just didn't knew what permissions are missing from the setup made by one of admins. If you check Synchronization Service Manager you can find recent status for all tasks. While most tasks were ending up successfully export task completed with error: permission-issue. This can be from broken inheritance or due to synchronization of Domain Admins accounts which is not going to work. But in our case it was none of that. Any account you would create it would error out. When you check documentation regarding permissions you need to setup the list is pretty clear. 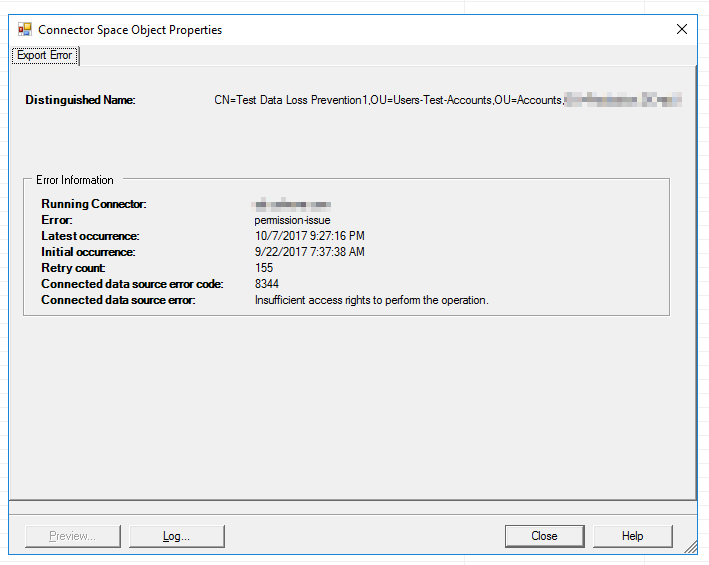 Exchange hybrid deployment Write permissions to the attributes documented in Exchange hybrid writeback for users, groups, and contacts. Password writeback Write permissions to the attributes documented in Getting started with password management for users. 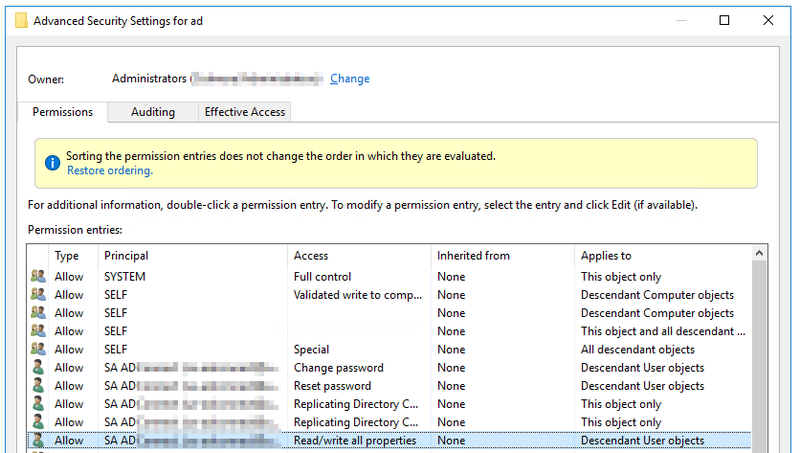 Device writeback Permissions granted with a PowerShell script as described in device writeback. Group writeback Read, Create, Update, and Delete group objects in the OU where the distributions groups should be located. Actually after some testing just setting Write All Properties is enough. It's interesting it's not on the list for permissions thou. Following code is an easy way to give proper permissions for Office 365 Password Write-back on the domain side. The Out-null is left commented out so you can check out the output. If you don't like it, just add it back. $cmd = "dsacls.exe '$passwordOU' /I:S /G '"$accountName":CA;"Reset Password";user'"
$cmd = "dsacls.exe '$passwordOU' /I:S /G '"$accountName":CA;"Change Password";user'"
$cmd = "dsacls.exe '$passwordOU' /I:S /G '"$accountName":WP;lockoutTime;user'"
$cmd = "dsacls.exe '$passwordOU' /I:S /G '"$accountName":WP;pwdLastSet;user'"
Following code is an easy way to give proper permissions for Office 365 Replicating Directory Changes on the domain side. While it's possible to do this manually, this way is much faster. $cmd = "dsacls '$DefaultNamingContext' /G '"$Account":CA;"Replicating Directory Changes";'"
$cmd = "dsacls '$DefaultNamingContext' /G '"$Account":CA;"Replicating Directory Changes All";'"